With the steady increase in sport participation there is also an increase in the number of injuries, aches and pains. In the majority of injuries the need to immediately apply ice is paramount to the recovery. For acute joint, ligament and muscle damage, ongoing ice application may be required. Ice bags, in some form, have been around since there was a need to reduce swelling or dull the pain of an injury, as they are a simple and effective way to instantly relieve pain and reduce swelling. Whilst physiotherapy and sports medicine clinics utilise and can supply ice/heat bags, it would be far better to see people already armed and prepared with the suitable ice/heatbags within their homes, offices and sporting/first aid kits prior to injury or aches and pains occurring. Icing of injuries and muscles/joints after heavy use should become the everyday norm. 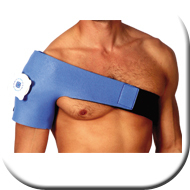 Now ice/heat bags using the simplicity of ice and hot water are easy to purchase for the general public who need the reassurance of having the right equipment to treat an injury or manage aches and pains when the time is necessary.